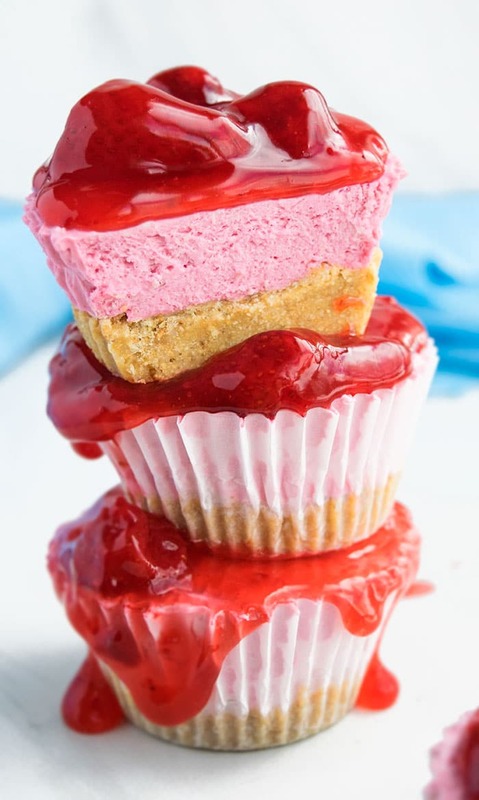 Easy no bake strawberry cheesecake cupcakes with graham cracker crust and strawberry topping are simple to make and healthier than traditional cheesecakes. 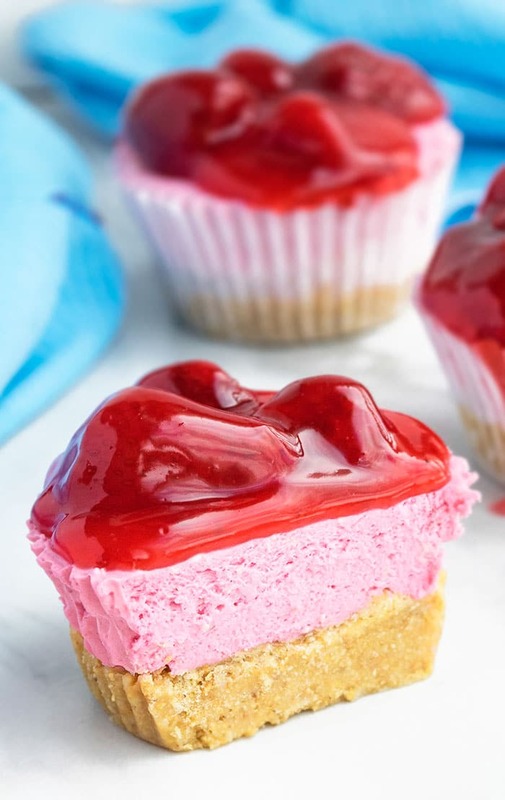 These no bake MINI strawberry cheesecake cupcakes are to die for! That graham cracker crust topped off with that creamy, cheesy, fruity filling and glossy strawberry topping will have your friends begging you for the recipe. This recipe is obviously different than my New york cheesecake cupcakes because those require baking and these ones DON’T, which makes these ones so much EASIER and QUICKER. Use MELTED coconut oil to ensure it mixes well with the graham cracker crumbs and there are no lumps. To make it a little HEALTHIER, use low fat cream cheese and low fat Greek yogurt. To make these cheesecakes super CREAMY, use full fat cream cheese and full fat Greek yogurt. I highly RECOMMEND using a little gelatin in the cheesecake mixture so that it sets better and holds its shape well. You can use homemade strawberry topping or store-bought strawberry topping. Just make sure it’s THICK so it does not drip off the cheesecakes completely. 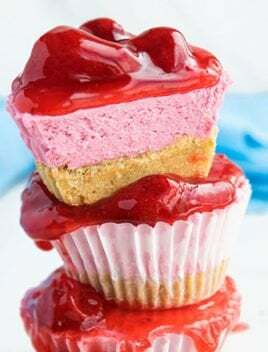 Use pink gel food coloring to ENHANCE the color instead of liquid food coloring since using too much liquid can alter the consistency of the cheesecake mixture. Keep these cheesecakes CHILLED so that they hold their shape well plus they taste better chilled rather than warm. Add the topping prior to serving or when the cheesecake mixture has SET. Make sure to really PACK DOWN/PRESS DOWN the graham cracker crust mixture into each cupcake liner so that it doesn’t crumble when you peel off the liners later. 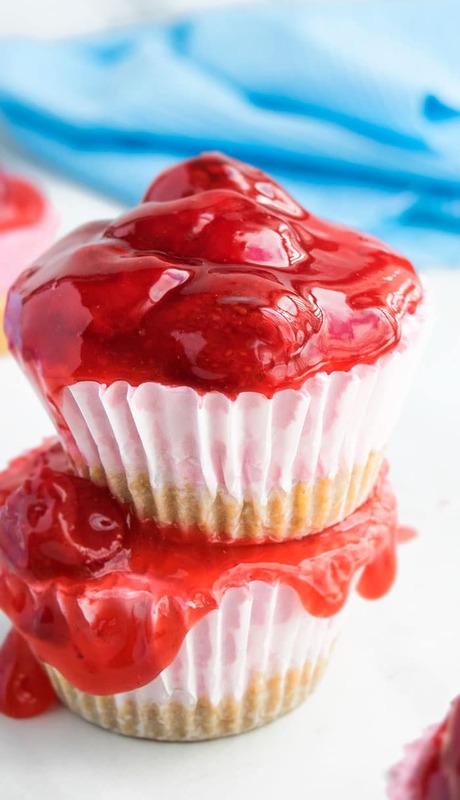 Instead of strawberry topping, make cheesecake cupcakes with sour cream topping. Instead of preparing a graham cracker crust, you can make cheesecake cupcakes with vanilla wafers or even Oreo cookie base. To make pumpkin cheesecake cupcakes, add a little bit of pumpkin spice in the cheesecake filling and use pumpkin flavored Greek yogurt. To make chocolate cheesecake cupcakes, add 1/4 cup cocoa powder in the cheesecake mixture. You can also use coffee or chocolate flavored Greek yogurt to really enhance the chocolate flavor. To make red velvet cheesecake cupcakes, add 1 tbsp cocoa powder and lots of red food coloring and pair it with a sour cream or cheesecake topping. To make no bake Oreo cheesecake cupcakes or mini Oreo cheesecake cupcakes, prepare an Oreo cookie crust instead of a graham cracker crust. 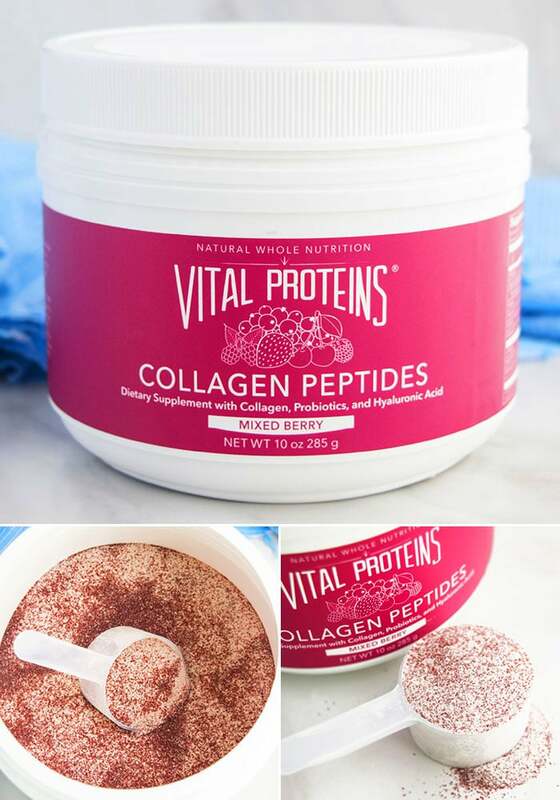 This time, I used Vital Proteins mixed berry collagen peptides. It has a a WONDERFUL berry flavor as well as a lovely fruity fragrance. It also has a beautiful red color and gives your desserts a nice bright tinge. I only added a scoop but you can add more, if you like. You can use it in baked and no bake desserts and even smoothies…. lots of POSSIBILITIES! How do you know when a cheesecake is done? You know it’s done when the cheesecake layer has set and holds its shape. How to make cheesecake cupcakes? how to make no bake cheesecake cupcakes? Start off by preparing the graham cracker crust and press it down in the base of the cupcake liners. Then, prepare the no bake cheesecake mixture by mixing together cream cheese, strawberry Greek yogurt, honey, dissolved gelatin, whipped cream, berry powder until smooth. Add scoops of this mixture on top of the graham cracker crusts. Spread it out evenly with a spatula. Chill and top it off with strawberry topping and enjoy! How long does it take for a no bake cheesecake to set? It depends on your fridge cooling settings but typically takes 2-3 hours to fully set. How do you make graham cracker crust for cheesecake? Mix together graham cracker crumbs with melted coconut oil or melted butter and press that mixture tightly in a cheesecake pan or cupcake liners. In a non-stick saucepan, add strawberries, honey, water and cook on medium heat for about 20 minutes OR until strawberries become soft and liquid is reduced and starts to become thick. To make it even thicker, dissolve some cornstarch and water in a separate cup and pour that in the saucepan, while constantly mixing to prevent any lumps from forming. Allow the mixture to cool down completely. In a mixing bowl, add graham cracker crumbs and coconut oil. Mix until you have a crumbly mixture. Drop 1 tablespoon of this mixture into each cupcake liner and use the base of a shot glass to press down the mixture and make a tight base. In a mixing bowl, add cream cheese, yogurt, honey, berry protein powder (optional)and mix until smooth. Add whipped cream (optional), dissolved gelatin, pink food coloring (optional) and mix until smooth and creamy. Tip: If you have never worked with gelatin before, add water and gelatin in a a small cup for about 3 minutes until it blooms. Heat in the microwave until gelatin melts completely and you have a smooth mixture. Spread this mixture evenly on top of all the graham cracker crusts. Chill i the fridge for 2-3 hours or until the cheesecake mixture sets. Prior to serving, top off each mini cheesecake with strawberry topping and enjoy! This looks SO good! I love how easy this is to make! My favorite flavor! These cheesecake looks irresistible! These mini cheesecakes look so festive and Spring-y! Perfect little treat!